The Scottish government has been urged to focus on supporting the growth of Scotland's "fragile" economy in its forthcoming draft budget. Finance Secretary Derek Mackay is to set out his proposals on Thursday. The Fraser of Allander Institute think tank said the budget was coming at a "crucial" time, with Scotland's economy "stuck in a cycle of weak growth". Mr Mackay has pledged to invest in public services and protect the economy despite the "challenges" facing him. He is putting the finishing touches to his second draft budget as Scottish finance secretary, ahead of setting it out at Holyrood on Thursday afternoon. An increase in income tax is widely expected to be the centrepiece of his proposals, with First Minister Nicola Sturgeon arguing that the time has come to consider a "modest" rise to generate funds for public services. Ms Sturgeon has also pledged to lift the public sector pay cap as well as committing to "at least a real terms increase in the revenue budget" for Scotland's NHS and more money for schools. Forecasts on the outlook for the economy from the Scottish Fiscal Commission will also be published alongside the budget for the first time. In its latest economic commentary, the independent Fraser of Allander Institute (FAI) said weak demand and uncertainty caused by Brexit would continue to dampen growth going forward, making the budget an "important opportunity" for ministers to set out their plans to support the economy. The document paints a mixed picture of Scotland's economy, which is "continuing to grow, albeit at a relatively slow pace". Growth in Scotland has been around one-third of that of the UK as a whole across the year, but employment is "close to a record high". Image caption Finance Secretary Derek Mackay has acknowledged that his budget comes amid "challenging circumstances"
While Chancellor Philip Hammond highlighted £2bn of extra funding for Holyrood in his budget in November, the bulk of this money comes in the form of capital funds. Analysis by the Scottish Parliament's impartial information centre found that the block grant for day-to-day revenue spending for 2018-19 will actually fall by £199m in real terms - although this is offset by funding for capital projects, amounting a real-terms budget increase of 0.1% overall. The FAI commentary said Mr Mackay would be left with "some big decisions" on revenue budgets, with a "stark" outlook for local government in particular, while noting that "the outlook for capital is much healthier". The group's director Graeme Roy said ministers "undoubtedly face delivering a tight budget settlement", in light of the cut to the resource budget and his expectation that the Scottish Fiscal Commission would "revise down their estimates of the outlook for devolved taxes". He said: "With the Scottish budget now much more dependent upon the tax revenues generated in Scotland, boosting Scotland's fragile economy will be crucial in helping to alleviate budget constraints over the long term. "With major manifesto commitments to pay for in health, education, childcare and policing - not to mention a more generous pay settlement for public sector workers than those in England - 'non-protected' areas will be in line for an extremely tough settlement." The group's head of fiscal analysis David Eiser added that budget planning "remains remarkably short-sighted", calling for more work to address long-term challenges that public services face. 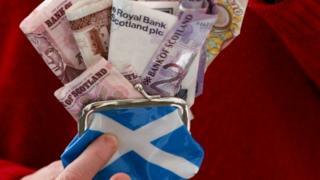 Mr Mackay has agreed that the budget comes "in the most challenging circumstances we have faced since devolution". He said his budget would "invest in public services, protect our economy and deliver greater fairness", as well as putting "more money into our NHS" and supporting business. A Scottish government spokeswoman added that the budget would help deliver "a future-proofed, forward thinking Scottish economy", and would "prioritise economic growth and innovation to enable Scotland to grasp the opportunities presented by a rapidly changing global economy". Opposition parties have sought to put Mr Mackay under pressure ahead of the budget, with new Labour leader Richard Leonard calling for protection for local authorities and the Conservatives warning against tax rises. Business leaders have also made their views clear, with the Federation of Small Businesses and the Scottish Chambers of Commerce both warning against tax rises.